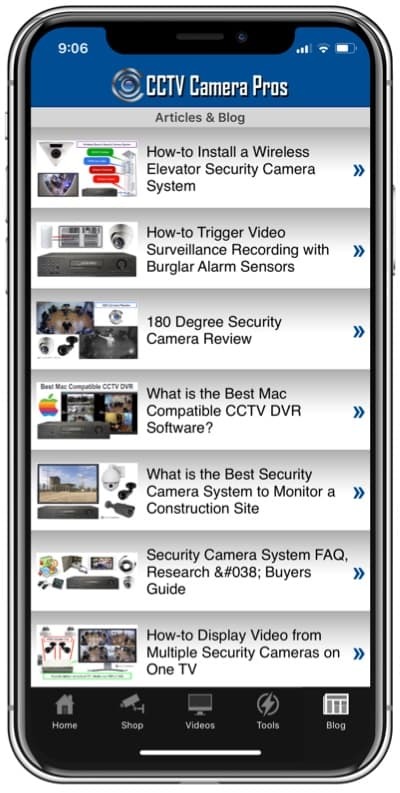 At CCTV Camera Pros, our tech support team is often asked if older CCTV DVRs support remote viewing of security cameras from a mobile app (iPhone and Android). This article was written to assist people in figuring this out. Here are some things that you can do to determine if your DVR supports remote management and live camera viewing. 1: Does Your DVR Have a Network Port? In order to watch your cameras remotely, your DVR must have a network port (LAN / Ethernet port). This is so that it can be connected to a network router. Look on the back of your DVR to see if there is a network / Ethernet port. In most cases this would be at the back of the DVR and will look similar to this. The above image shows the back of our 4 channel iDVR-PRO4A. The network port has been marked with a red square. Another identification mark to look out for is 2 small LEDs located just above the network port – normally yellow /green in color. These LEDs will light up and blink repeatedly when data flows to and from your DVR. 2: Does Your DVR Have a Mobile App? Unfortunately, there are no universal apps for iPhone and Android that work with all DVRs. Each security manufacturer develops mobile apps specifically for their product line. Many customers that contact us with older DVRs do not know who the manufacturer is and they do not have contact with the supplier that sold their DVR to them. To track down the manufacturer, check for markings on your DVR for a product code. Look on the back of your DVR to see if there is a manufacturer product code. Most surveillance manufacturers use silver product stockers like the one above. 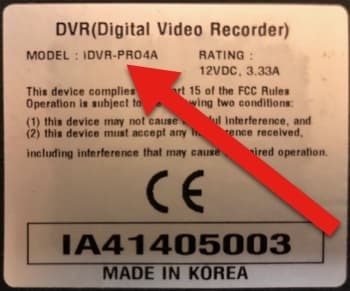 You can see the model of this DVR is iDVR-PRO4A. So in this case, I would recommend doing a search on google for “iDVR-PRO4A iPhone app” or “iDVR-PRO4A Android app”. Also, look for a brand or model on the front of the DVR. 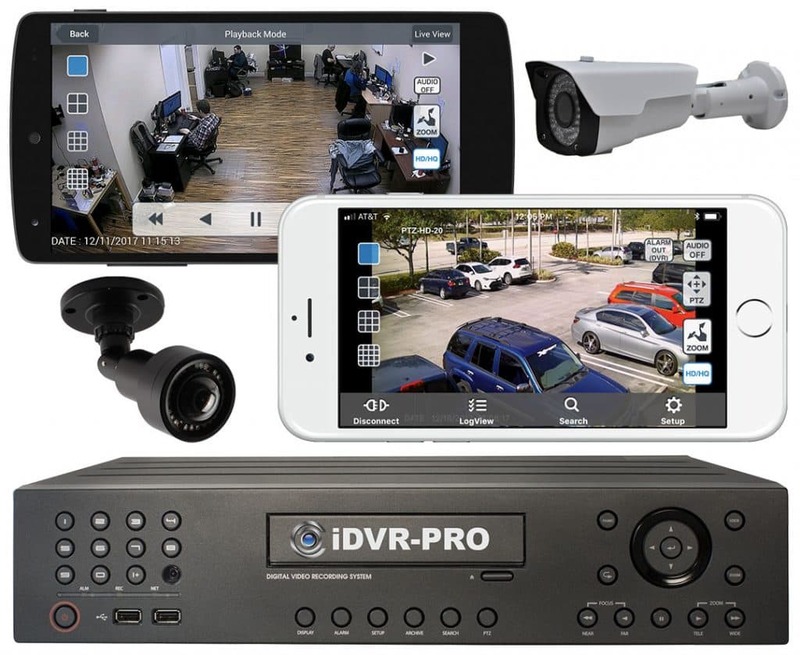 CCTV Camera Pros puts our iDVR-PRO brand on all of our iDVR-PRO CCTV / HD security camera DVRs. Using this example, I would recommend searching on Google for “iDVR-PRO iPhone app” or “iDVR-PRO Android app”. If you find the app for your DVR, download and install it. Unfortunately, many of our competitors sell products that are completely white labeled so you do not know who the original manufacturer is. It is very typical of CCTV DVRs manufactured over the past 10 years to be simply labeled H.264 CCTV DVR or H.264 Surveillance DVR. H.264 is NOT a brand or model. H.264 is an international video compression standard that millions of devices use. Virtually every DVR manufactured between 2007 and 2016 used H.264 video compression. H.264 is not a brand, so unfortunately searching for H.264 CCTV DVR iPhone app is not going to get you anywhere. You must have a high speed Internet connection at the location of your DVR. This will typically be via a cable or DSL modem. In most cases, you need to connect your Internet modem to a router. Some modems that are supplied by cable and DSL providers also act as routers. Please check with your Internet provider to see if the modem they supply is also a router. Connect your DVR to your router using a CAT-5 cable. Once your DVR is connected to your network, you must setup port forwarding to enable remote access to your security cameras. Here are a few articles that go over port forwarding in detail. Port Forwarding Setup for CCTV / What is Port Forwarding? The settings for each DVR and app are slightly different. Hopefully, the manufacturer of yours has documentation. Here is the setup guide for our iDVR-PRO mobile app. You may be able to use it to improvise the setup for non iDVR-PRO models. For many users, network setup and port forwarding is intimidating. If you purchased your equipment from CCTV Camera Pros, we offer free assistance with all of this for the life of the product. Typically, we login to customer’s systems remotely and do all of this on their behalf if they want us to. We also offer remote access setup for customers that did not purchase CCTV Camera Pros equipment for a fee. You can contact us here for a quote here. It typically costs $129 and we guarantee that your remote camera viewing will work or we do not charge you anything. Watch this video to see the a remote view of HD security cameras from iPhone. These cameras are connected to an iDVR-PRO surveillance DVR. Watch this video to see the a remote view of 1080p security cameras from Android. These HD cameras are connected to an iDVR-PRO surveillance DVR. In addition to the outstanding mobile apps, iDVR-PRO also includes remote viewing software for Mac and remote viewing software for Windows.